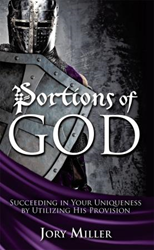 Within the pages of Jory Miller’s new book, Portions of God - Succeeding in Your Uniqueness by Utilizing His Provision, ($10.99, paperback, 9781498443487; $5.99, e-book, 9781498443494) he exposes readers to a new perspective of God’s armor so that they might excel in their God-given uniqueness. The book illustrates each portion of God’s armor with biblical insight and personal episodes. The author stresses that His armor is not commonly regarded as assets that enable people to provide originality by way of God’s righteous philosophy. God’s armor will inspire the believers of Christ to arrive at their destiny by utilizing the armor to establish righteous innovation. The armor is not solely about the prevention of wickedness. In order to overcome, there must be a righteous nature to produce godliness that persuades secular thinking towards the Heavenly Father’s domain. Jory Miller inspires readers to establish their own uniqueness through Christ's righteousness. Jory Miller has spent multiple hours of research on self-actualization, righteousness, and business. He possesses a Bachelor of Science from Oral Roberts University and a Master of Business Administration from Oklahoma Wesleyan University. He has also completed several hours of doctoral level research assignments. Despite his extensive education, Jory realized that the Lord did not lead him to pursue that degree. He believes it is not about how much information a person possesses. It is about how much one knows who he or she is in Christ. Knowledge has no value if the person having the knowledge doesn’t understand who he or she really is. Xulon Press, a division of Salem Media Group, is the world’s largest Christian self-publisher, with more than 15,000 titles published to date. Retailers may order Portions of God - Succeeding in Your Uniqueness by Utilizing His Provision through Ingram Book Company and/or Spring Arbor Book Distributors. The book is available online through xulonpress.com/bookstore, amazon.com, and barnesandnoble.com.